Spectator Liability: This is to protect you from liability suits arising out of injury to your spectators and any property damage to their property. Remember that a spectator is a spectator only so long as he or she is in the "spectator area". Once they go into the "pit area" or the "competition area", they are now required to sign a waiver release, the same as a contestant or worker and quite possibly will no longer be considered a spectator. Participant Legal Liability: This is to protect you against liability suits brought by your participants and workers or anyone else who is in the "pits or competition area" that is injured and brings a liability suit against you claiming that your negligence caused them to be injured. It is vital that you have each of these people sign a waiver release upon entry to the area or your coverage could be negated. Products Liability: This protects you from liability arising out of sale of souvenirs or food products. Personal Injury: This protects you against suits brought as a result of false arrest, malicious prosecution, oral or written publication that libels or slanders a person and is considered an invasion of their privacy. This coverage involves the intangible emotional and mental interest that are invaded or violated. Note that the event / race liability plan is designed to provide protection for and to the competition event participants. Other policies will have different criteria and standards to follow. As additional insured's, our policy contract also provides protection for any person or organization engaged in operating, managing, sanctioning, or sponsoring the covered program. Participants have coverage but only with respect to bodily injury or property damage to persons other than any other participants, competition vehicle owners, competition vehicle owners, competition vehicle sponsor or employee. Any competition owner and competition vehicle sponsor is covered only with respect to bodily injury or property damage to persons other than any participant, competition vehicle owners, competition vehicle sponsor or employee. 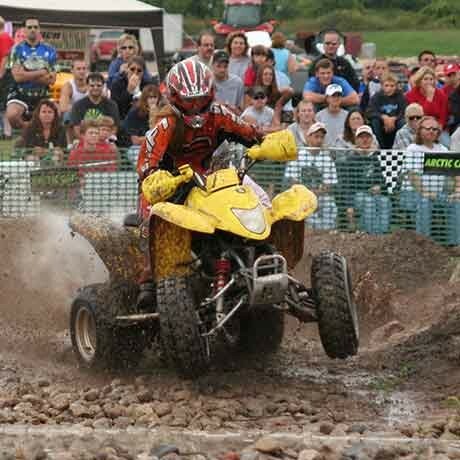 As it applies to race day / event day coverage, we do not provide liability protection on behalf of the spectators as they may have access to and ride their own off-highway vehicles (OHV). Underlying coverage may exist under a separate policy plan if the landowner has secured and paid for facility park insurance or under the individual OHV owners / riders personal liability plans, subject to the conditions and policy terms therein. As such conditions apply, it is important to curtail and limit OHV access in the spectator viewing area(s). The spectator area should be well designated and defined, protected from any vehicular traffic of any sort. This is often accomplished by establishing an OHV corral policy, an area designated for event spectators for their own machines, enforced by event marshals and/or club event courtesy patrols. The participants must be allowed to read and then sign the race / event waiver. For minors under the age of 18, the parent and minor must also sign a different waiver. Any spectator that has access to the participant pit area is no longer deemed a spectator but a participant, thus requiring their reading of the waivers and agrees to the terms therein.